Reading and share top 7 famous quotes and sayings about Personae by famous authors and people. Browse top 7 famous quotes and sayings about Personae by most favorite authors. 1. "In politics, it's very theatrical. There's a lot of stage craft. 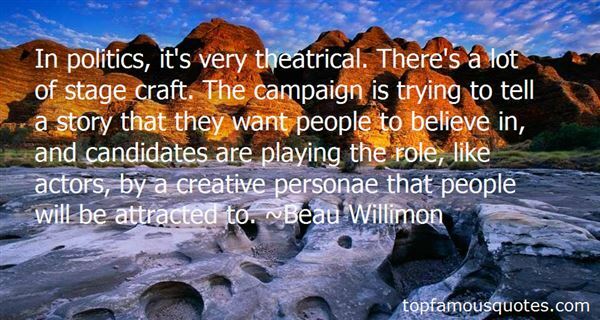 The campaign is trying to tell a story that they want people to believe in, and candidates are playing the role, like actors, by a creative personae that people will be attracted to." 2. "For all the feminist jabber about women being victimized by fashion, it is men who most suffer from conventions of dress. Every day, a woman can choose from an army of personae, femme to butch, and can cut or curl her hair or adorn herself with a staggering variety of artistic aids. But despite the Sixties experiments in peacock dress, no man can rise in the corporate world today, outside the entertainment industry, with long hair or makeup or purple velvet suits." 3. "[Nietzsche thinks artists undersexed]:"Their vampire, their talent, grudges them as a rule that squandering of force which one calls passion. If one has a talent, one is also its victim; one lives under the vampirism of one's talent." -- Friedrich Nietzsche, as quoted in Camille Paglia's "Sexual Personae"
4. "Destiny stands by sarcastic with our dramatis personae folded in her hand." 5. "I liked myself this way, it was such a relief to be free of disguises an prettiness and attractiveness. Above all that horrible, false, debilitating attractiveness that women hide behind. I puled my hat down over my ears so that they stuck out beneath it. 'I must remember this whn I get back. I must not fall into that trap again.' I must let people see me as I am. Like this? Yes, why not like this. But then I realized hat the rules pertaining to one set of circumstances do not necessarily pertain to another. Back there, this would just be another disguise. 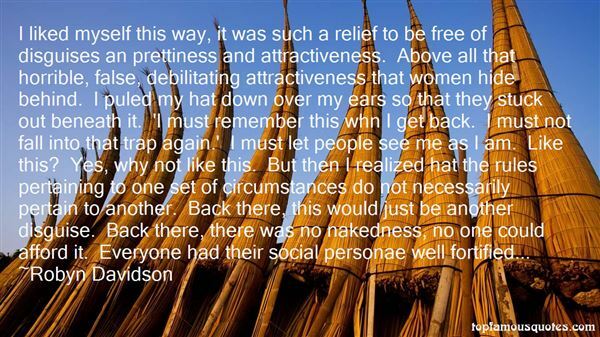 Back there, there was no nakedness, no one could afford it. Everyone had their social personae well fortified..."
6. "She had been amazed-and a little relieved-to discover that she was not concealing some private neurosis; almost all imaginative people heard voices. 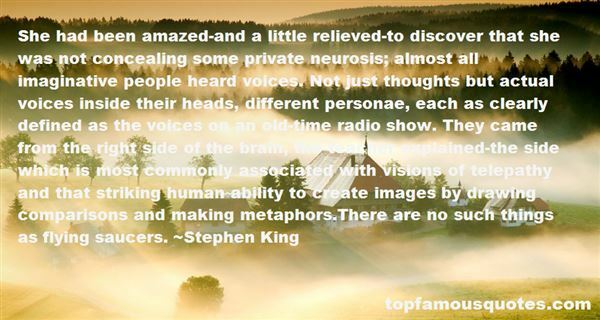 Not just thoughts but actual voices inside their heads, different personae, each as clearly defined as the voices on an old-time radio show. They came from the right side of the brain, the teacher explained-the side which is most commonly associated with visions of telepathy and that striking human ability to create images by drawing comparisons and making metaphors.There are no such things as flying saucers." 7. "Pharaoh is clearly a metaphor. He embodies and represents raw, absolute, worldly power. He is, like Pilate after him, a stand-in for the whole of the empire. As the agent of the "empire of force," he reappears in many different personae.9"
But if you eat this chap who's God,' said Llewelyn stoutly, 'how can it be horrible? If it's alright to eat God why is it horrible to eat Jim Whittle?' 'Because,' said Dymphna reasonably, ' if you eat God there's always plenty left. You can't eat God up because God just goes on and on and on and God can't ever be finished..."